The third daughter of a school teacher father, Cynthia Kuun grew up always knowing that she will one day be an artist. She had shown artistic talents at an early age and always kept busy by drawing pencil sketches which she sold to classmates. She has fond memories of art classes at primary school when paints and clay were handed out during art periods. Those were always the best times. The main focus of her paintings has been people, mostly female playing musical instruments using photography and live models. She also enjoys painting figures in a somewhat abstract style, but her love for realism will draw her back to it from time to time. She had a number of art teachers since 1989 but will always have fond memories of one fabulous teacher, Muriel Brown, now retired, who had studied art in England. She has been a professional artist since 1995 and with her enormous natural talent, self discipline, love and devotion to her work, she mastered the skill. She paints whatever she feels like and draws her inspiration from everyday scenes around her. She also does special commissions and her artwork has already been sold to satisfied customers throughout South Africa. "I believe there is no simple recipe for a happy and successful life especially when it comes to art. It is perseverance and hard work. I enjoy painting the female form especially the beauty and charm of small children. 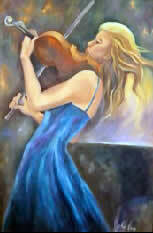 I feel so blessed when I sell a painting and see the expression of gratitude on a viewer’s face. I often can change my mood just by painting what I love. For my inspiration I look to Sargent, Brooks and Vermeer as the masters, but I continually grow and develop my own style."